Kobe is Japan's sixth largest city, a seaport city lying on the north side of Osaka Bay on the southern side of the island of Honshu. Considered part of the greater Osaka area, it is Japan's fourth largest seaport by freight volume. 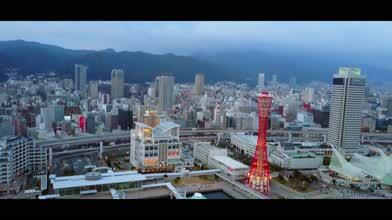 In this video, Styfly Studio uses a DJI Mavic Pro drone to take us on an aerial tour of Kobe. You'll get a bird's eye view of this important (and very old) seaport, whose harbor is dotted with artificial islands to increase the city's useable land area. Description: The Port of Kobe is a Japanese maritime port in Kobe, Hyōgo in the greater Osaka area, backgrounded by the Hanshin Industrial Region. Located at a foothill of the range of Mount Rokkō, flat lands are limited and constructions of artificial islands have carried out, to make Port Island, Rokko Island, island of Kobe Airport to name some. In the 10th century, Taira no Kiyomori renovated the then Ōwada no Tomari (大輪田泊?) and moved to Fukuhara (福原? ), the short-lived capital neighbouring the port. Throughout medieval era, the port was known as Hyōgo no Tsu (兵庫津?). In 1858 the Treaty of Amity and Commerce opened the Hyōgo Port to foreigners. In the 1970s the port boasted it handled the most containers in the world. It was the world's busiest container port from 1973 to 1978.